Only a handful of months after the introduction of the European and North American ECAs, a number of operators and authorities have highlighted issues relating to fuel quality, compatibility and stability. Fuel testing agencies continue to link declining sulphur levels with increasing levels of catalytic (cat) fines, which can lead to subsequent engine damage. With changes in operational processes brought about by the need to comply with increasingly stringent legislation, operators require a detailed understanding of the effect these changes have on the vessel and equipment, in order to ensure safe, compliant and efficient operations. With the global ECA potentially coming into force as early as 2020, increasing numbers of vessels will be affected by these issues. Already the boundaries of the current ECA affect many popular trade routes. In order to achieve compliance, operators are adopting new technologies and procedures such as switching between heavy fuel oil (HFO) and compliant low sulphur fuel oil (LSFO). With operators now required to use a greater variety of marine fuel specifications, it becomes imperative that the fuel switching process is managed carefully. Not only for legal compliance, but also to ensure the safety of the crew and to maintain the mechanical integrity of their vessel. Both Transport Canada and the United States Coast Guard (USCG) have issued safety alerts in recent months regarding fuel switching, resulting largely from several reported incidents of machinery fuel space leakages. The warnings highlighted issues such as fuel tank modifications, improper management of fuel mixing and temperatures, and failing to ensure sufficient supplies of ECA compliant fuel. Echoing these concerns, at the recent IMO MEPC 68 meeting, a large number of delegates stated that the current MARPOL Annex VI Regulation 18 does not provide adequate governance over suppliers of fuel oil, and expressed a strong interest in examining this further when the regulations are reconsidered at MEPC 69 in early 2016. In the shipping industry today, the testing of density, viscosity, water contamination and pour point is no longer simply to ensure that the correct fuel has been delivered, but is now a mechanically critical part of safe and compliant propulsion. The mixing and blending of fuels from different sources would ideally be avoided, however the current bunkering infrastructure and market segmentation requires using a variety of fuel suppliers. For those vessels travelling through an ECA and switching from HFO to LSFO, this makes it all but impossible to avoid cross-contamination of fuels. It is therefore essential that engineers have tools at their disposal to monitor the fuel switching process and ensure that it is carried out safely. With this in mind experts at Parker Kittiwake have designed a range of solutions to ensure that compliance is navigated safely and without impacting operational efficiency. Testing the viscosity of both fuel and lube oil will inform engineers of what is needed to prevent system damage when switching to compliant fuel. The Parker Kittiwake Heated Viscometer monitors changes in fuel oil viscosity, preventing costly engine and machinery failures. Onboard testing for fuel compatibility when fuel switching is equally simple and time efficient with the Parker Kittiwake Compatibility Tester. It provides engineers with all the information needed to confirm the fuel delivered will remain stable, or recognise potential stability issues before fuel blending. For operators looking for the most comprehensive tools for safely managing the impact of changes in operational processes, real-time monitoring is the ultimate tool. With a noted increase in the presence of cat fines due to low sulphur fuels and the cracking process, monitoring the impact of this becomes crucial. Using magnetometry to quantify the iron in used cylinder oil, the LinerSCAN sensors report changes caused by abrasive wear, highlighting periods of increased physical or thermal stress. By monitoring wear levels in real time, engineers are alerted to escalating cylinder liner damage and are able to react quickly and take preventative action. 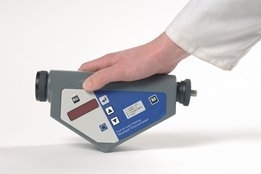 When used in conjunction with onboard tests such as the Parker Kittiwake Cold Corrosion Test to identify corrosive iron compounds in the scrapedown oil, engineers gain easy access to the information needed to alter the system's operating conditions and minimise corrosive wear and thereby reducing the cost of premature liner replacement. Proactive trouble-shooting using a combination of online, onboard and laboratory testing can result in significant savings, and decreased operational interruptions thanks to preventative maintenance and condition monitoring. With so many variables influencing bunker quality and combustion efficiency, and downstream accelerated wear cycles in both, progressive operators understand the importance of sampling and testing fuels has never been greater to protect their vessels, crews, critical machinery and revenue streams whilst maintaining a robust CSR policy towards the environment. With annual sales of $13.2 billion in fiscal year 2014, Parker Hannifin is the world's leading diversified manufacturer of motion and control technologies and systems, providing precision-engineered solutions for a wide variety of mobile, industrial and aerospace markets. The company employs approximately 57,000 people in 50 countries around the world. Parker has increased its annual dividends paid to shareholders for 57 consecutive fiscal years, among the top five longest-running dividend-increase runningrds in the S&P 500 index. For more information, visit the company's web site at www.parker.com, or its investor information web site at www.phstock.com.